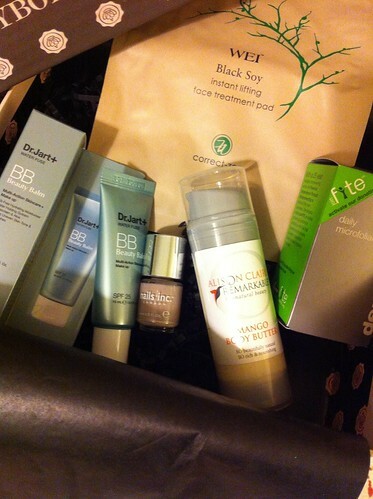 I recently heard about GlossyBox after trawling through lots of different beauty blogs, so I had to try it out myself! The company offers a monthly delivery of a range of beauty samples for a set price (£12.95 per month, but there are a range of cheaper options for longer subscription times), with different themes and random contents every month. I love surprises, and I love trying new things, so it sounded right up my street! Here’s my first delivery! The first thing I noticed is that these things really are packaged incredibly beautifully – in a patterned cardboard box for postage, and inside, a tough gift box, tied with a ribbon. Gorgeous! I got the Dermalogica Daily Microfoliant (which I actually used to use, so am very happy to receive again to see whether it still works on my skin), the Alison Clare mango body butter (used already, very nice smell, and thick formula – although you need to squeeze quite hard to get it out of the bottle! ), the Dr. Jart Water Fuse Beauty Balm (never would have tried this product, but I’m very intrigued to see whether it’ll work for me), the Porchester Square Nails Inc varnish, and the Wei Beauty face treatment pad! Looking online, it seems like not many people got the face treatment pad, so I’m very honoured (especially as this is a full sized product, and very pricey). Check back another day for my review of the Wei Black Soy treatment pad, and my thoughts on the other products in the box.